Pen #18 - OR - Pirrouette - OR - Barber Pole? Happy J.S. Bach’s birthday (Thursday). Headsets. That one always makes me want to go hang-gliding, for some reason. First, a tree. It’s a Jacaranda I found (you know how fond I am of that wood). Jacarandas are weird trees. They’re more like seagulls, who fly around devil-may-care, than geese or ducks, who fly in a well-ordered pattern. You’re comparing trees to birds, now? Yeah. I am. Shut up and listen. 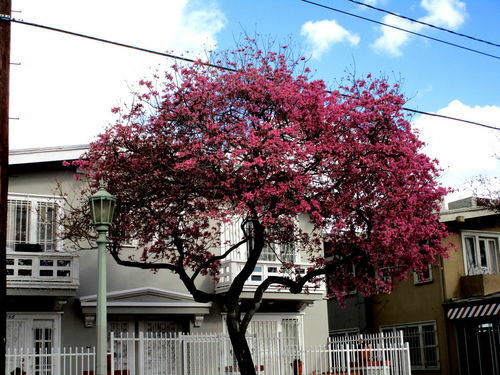 Most flowering trees of a species will bloom mostly at the same time. (It’s Spring, now, so, there are many examples. The Peach trees around here have been going nuts because of all the rain we’ve had this year. Also, the Japanese Magnolias are having a field day (they’re pretty much done and leafed out, now). Jacarandas, on the other hand, bloom when they’re of a mind to. Willy-nilly, you might say. Sure, there are streets that are lined with them, and those streets, sometimes, turn purple from one end to the other. But, on the whole, they’re unpredictable. I’ve been keeping my little peepers open (it’s impossible not to, what with what those who claim to know are calling a “super bloom” that’s going on). This, dear reader, is the only Jacaranda I’ve seen in bloom so far this year. Are you finished? Is this about a pen? Back in the days of the “Wild West,” if you had a tooth ache, you were as likely as not to seek help from the town barber – he kinda doubled as a dentist. When he got done yanking your troublesome tooth out, he had a towel that was soaked in blood. Well, if I’m a barber, I don’t want to throw the towel away. Nor do I want to just drop it on the floor. So, what I would do, as the town barber/dentist, would be that I would take the bloody towel out to the porch and nail or tack it to the wooden post that holds up the porch roof. A breeze would then come along and twist the the bloody towel around the post. This is the origin of the barber pole. You could know where to go to get a tooth pulled even if you were illiterate. It’s reality, Smartypants. Deal with it. I thought of a barber pole, when I first got the barrels for this pen round. That made me think of blood. (Now, you get to have the same bug in your head, too. You’re welcome.) I don’t like to think of blood. So, some kind of defense mechanism kicked in, as I was finishing up this pen. Here’s where my tortured mind ran screaming to. It certainly looks like one of those. The woods in the store-bought blank are, evidently, Hard Maple and Padauk (paDOOK. in case you’re unfamiliar). A really hard wood and a not-so-hard wood made this pen quite irritating to turn. You know what happens when your tool slices through a soft spot and hits a hard spot. It’s chatter and corkscrew looking for someplace to settle in. There’s nothing to do but sand it out. A lot of sanding went into this pen. More than most. Yet, I think the finish came out nicely. Nice colors on the pen! Trees here haven’t started blossoming, yet although you can see a change in the bark colors. If it warms up, they may strat in a couple of weeks. Peach and apple orchards are usually the first to color. Only things blooming here are crocus – I love those little purple flowers poking through the frost – lets me know that Spring is on the way. We have the traditional March Winds though – which will soon bring the April Showers. Nice story about barber poles. Where did you hear it? The Historian in me likes to know sources. And yes you put a bug in my head – now I’m going to have to google the lyrics to Sweeny Todd (what twisted mind came up with the idea for a musical comedy about a cannibal barber?). A beautiful pen – very Retro looking, like something from the 1940s. Spring sprang in mid-February, here. Followed, and accompanied by, rain for weeks. Then, last weekend, starting on Friday – four days ahead of the official first day of Spring – it became Summer. Temperatures got into the 90s. John: I don’t remember. Probably Paul Harvey, or someone like him. I reckon you’ve already begun your research, but here’s something. https://uppercutdeluxe.com/us/page/history-of-the-barber-pole/ According to this account, it goes back to the Middle Ages. Interestingly, as we speak, I’m attempting to stop some blood coming out of my left-fourth finger, where it got pinched between the reamer and the blank on a new pen I’m starting. If I can can get it to stop bleeding long enough to get a band aid on it, I’ll get back to work. God made Bandaids so we could keep the blood off the wood, right? I think I did warn you about making pens being addictive mate. Well done.